If you’re the type of person who only sees a movie if it gets Terry Gilliam’s stamp of approval, well, good luck. Because Gilliam—director of The Imaginarium Of Doctor Parnassus, Fear And Loathing In Las Vegas, and The Brothers Grimm—hates just about everything that comes out of Hollywood. 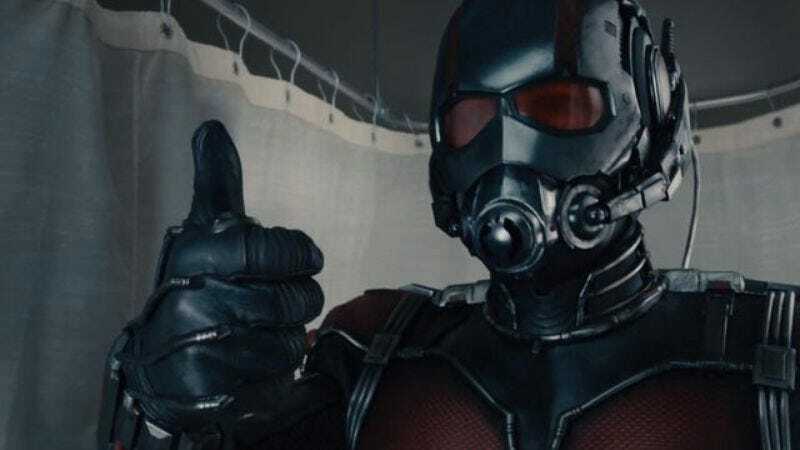 But the Monty Python alum had a few nice words to say about this summer’s Ant-Man—followed by a bit of a critique, of course. According to Indiewire, during a conversation with Sam Rubin as part of LiveTalksLA, Gilliam said he liked the Marvel Phase 2 film, but not everything about it, which sounds like a pretty standard film review. Also, superhero movies in general? Still not his thing. His opinions were definitely fresh, as he watched Ant-Man on the plane on his way to the event. “Now, Ant-Man I quite liked, I think there’s a lot of really good stuff in there,” he said. “And technically, it’s brilliant. But it’s also predictable, ultimately. We know where it’s gonna go, so the structure and the shape is all there. And okay, they play with it in various ways. But, that’s my problem, I don’t get the surprise I used to get, I want to go and be more surprised,” he added. So basically, there was some good stuff, and there was some not-so-good stuff. Namely, he’s not a fan of repetitive superhero origin movies or franchise obligations. “I also worry when things become so repetitive, and now we’ve got to get all the Marvel universe dancing with each other, so Superman has now got to make love to Batman or something,” he said. (Side note: We would very much like to see a film in which Batman and Superman are lovers, but as far as we can tell, that doesn’t seem to be a plot line in Batman V. Superman.) Gilliam continued: “And these are the things that create that complete and hermetically sealed world, [and that] really bothers me, because the Bible is more interesting, and the stories are more surprising, and actually more human.” Yep, there you have it. According to Gilliam, the Bible is more interesting than the Marvel Cinematic Universe. The question of whether superhero movies can still manage to be original is one that other directors have commented on recently, including Batman V. Superman director Zack Snyder. According to Snyder, Batman and Superman transcend superhero movies, but Gilliam will be the judge of that come 2016 when Batman V. Superman hits theaters. Earlier this year, director Steven Spielberg compared comic book movies to Westerns, and suggested that the former would eventually die out as a trend in the same way the latter did. Gilliam, however, thinks the Westerns would win in a battle of humanity. “I was thinking about this the other day, I moan about this, but when I was younger it was Westerns [that were popular]. But I even thought within a Western, there’s a formula there, but there was still more places to play, there was more humanity—real humanity—as opposed to an artificial, inflated, superhero [movie],” he said.